We had our Kitty Cat alleycat tonight. Full report to come, but I HAD to post this photo. 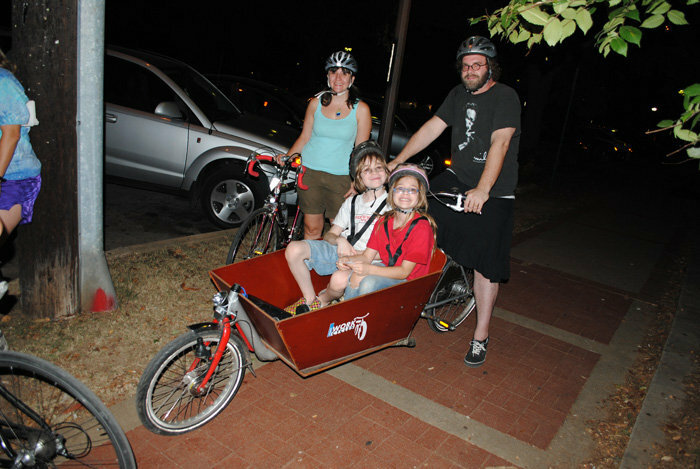 Our friend Joshua rode on a Bakfiets with 120 lbs worth of kids (8 and 10 years old ish) IN A SKIRT, for the entire 1o mile race. He deserves a Dad of the Decade Award. Considering how exhausted I was just hauling myself up all the hills for the physical challenges, I can’t believe he did it. Total badass Dad. Oh, and his wife was home sick so he did it all alone. In-effing-credible. DUDE. That’s unbelievable. Dad of the decade, for sure. We were on our way back from the movie at RR Park and saw him peddling his kids (on the way home, I guess). Cool bike, but OUCH, you know? I tried to pull my ONE (then 5-yr-old) daughter in a trailer once and that was so hard on hills that I gave up. I can’t imagine. I hope you gave him a prize.